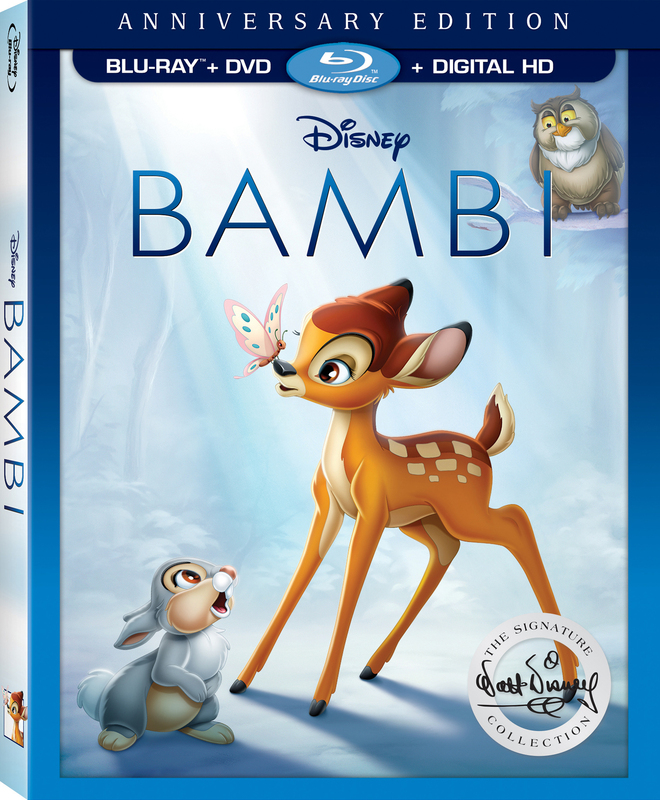 Walt Disney’s 1942 animated classic Bambi is celebrating its 75th anniversary this year, and has gotten a new Blu-ray release as part of their Signature Collection to honour the occasion. Adapted from Austrian author Felix Salten’s 1923 novel, Bambi follows a young deer who is destined to take over his father’s place as the Great Prince of the Forest. We watch as he comes of age with his mother throughout the changing seasons, befriending other forest creatures and coming to experience both the joy and sadness of life. It remains one of Disney’s best and most cherished works for a multitude of reasons. The film faced a lengthy production process that led to multiple technical breakthroughs for the studio, with them focusing on more impressionistic backgrounds so as not to distract from the characters. The animators also went to great lengths to draw the animals more realistically, following the more stylized designs in films like Snow White and the Seven Dwarfs, studying real animals that were brought into the studio and footage of them in the wild. The artists also did extensive effects work on the way elements like water and raindrops were presented in the film, and furthered the use of their revolutionary multiplane camera to offer layers of depth to the visuals. But as much as Bambi still holds up as a groundbreaking technical achievement in Disney’s history, the film also continues to present a masterclass in the art of deceptively simple storytelling. The film offers a wonderful mix of beautifully drawn images, adorable characters and a gently paced narrative, with moments of emotionally gutting tragedy and powerfully moving themes. It’s a movie that finds beauty in the changing of the seasons, and heartache in the circle of life, that is so affective precisely because of its minimalistic approach. After 75 years, Bambi remains just as much of a gorgeous and poignant work of art as it ever was, and one that continues to endure. Most of the classic bonus features from the 2011 Diamond Edition release have also been transported over here, including the documentary The Making of Bambi: A Prince is Born, the featurette Inside the Disney Archives, and Disney’s Oscar-winning 1937 animated short The Old Mill. For completists, and especially for those who never got a copy of the film on Blu-ray, this Signature Collection release comes highly recommended. As an added bonus, the package also comes with a very nice collectible art card featuring a beautiful illustration by the late artist Tyrus Wong, who worked closely on the film. Bambi is a Walt Disney Studios Home Entertainment release. It’s 70 minutes and rated G.